Appearing in 1638, Shrila Vishvanatha Chakravarti Thakur (Hari Vallabha Dasa) came in the disciplic succession from Sri Narottama Dasa Thakura. Visvanatha took diksa from Sri Radha Ramana Cakravarti. Although married, Visvanatha was indifferent and soon renounced family life. He came to Vrindavana dhama and did Krishna bhajana at Radha-kunda. He was known as "the crest jewel of the Vaisnavas" because of his pure devotion, scholarship, and realized perception of Radha Gokulananda's intimate conjugal pastimes. Gaudiya authorities say that Sri Rupa Goswami is vag-devavatara (an incarnation of the god of speech). And Gaudiya acaryas, especially among his direct disciples, believe that Visvanatha Cakravarti Thakura is an incarnation of Sri Rupa Goswami. Among all Gaudiya Vaisnava acaryas only Visvanatha Cakravarti comes close to matching Srila Rupa Goswami's profound realizations on the Absolute Truth. Visvanatha Cakravarti's name itself implies his position. Visvanatha means "He who reveals the jewel of devotion to Visvanatha (Sri Krishna, the Lord of the universe)." Cakravarti means "he who expands the cakra (circle) of bhakti." Sri Bhaktisiddhanta Sarasvati Thakura said, "Visvanatha Cakravarti Thakura was the protector, guardian, and acarya during the middle period (1600-1700) of the historical development of Gaudiya Vaisnavism." The growth of Gaudiya Vaisnavism began with Sri Caitanya Mahaprabhu. It was later rejuvenated by Srila Thakura Bhaktivinoda, spread by Srila Bhaktisiddhanta Sarasvati, and broadcast all over the world by Srila A.C. Bhaktivedanta Swami Prabhupada, the Founder Acarya of ISKCON. 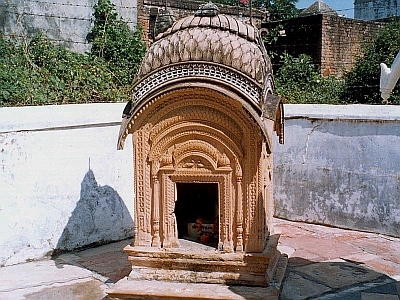 During his stay in Vrindavana, Visvanatha worshiped Deities of Radha Gokulananda and Sri Giriraja. His Govardhana sila was first worshiped by Lord Caitanya, then Raghunatha Dasa Goswami, Krishna Dasa Kaviraja, Sri Mukunda Dasa, Srimati Krishna Priya Thakurani, and Visvanatha Cakravarti. Today this Giriraja Govardhana Deity resides in the Radha-Gokulananda temple in Vrindavana. Some claim the Govardhana sila is in "Bhagavat Nivas" in Ramana Reti near the ISKCON Krishna Balarama Mandir. In a dream Lord Sri Krishna ordered Visvanatha to make commentaries on the Goswami's books. Immeditately, he started writing prolifically. Clouds would shield him from the sun whenever he sat to write. Once a torrential downpour flooded the area where Visvanatha was writing his Bhagavata commentaries. Miraculously, not a drop touched Visvanatha or his Bhagavata manuscript. While compiling Mantrartha Dipika (explanation on Kama Gayatri), Visvanatha became perplexed. According to his exhaustive research which indicated twenty five, he couldn't substantiate why Krishna Dasa Kaviraja wrote in Caitanya-caritamrta that Kama Gayatri contains twenty-four and one-half syllables. And that these syllables correspond to the twenty-four and one-half moons present on Krishna's transcendental body. "The solution to the half syllable is found in the book Var-nagama-bhasvadi. Seeing this book, Krishna Dasa Kaviraja wrote as he did, The letter ya which is followed by the letter vi as in the words kama devaya vidmahe is considered to be a half syllable. This falls on Krishna's forehead because His forehead is shaped like the halo of a half moon. All the other letters of the mantra are full syllables and therefore full moons. Now wake up, check that book, and compile this evidence for everyone's benefit." Instantly awaking, Visvanatha cried out in ecstasy – "Hey Radhe! Hey Radhe! Hey Radhe!" Having Radharani's darsana infused Visvanatha Cakravarti's writing with divine sakti. He felt that he had been accepted as one of Srimati Radharani's confidential maidservants. His writings reflected this realization. 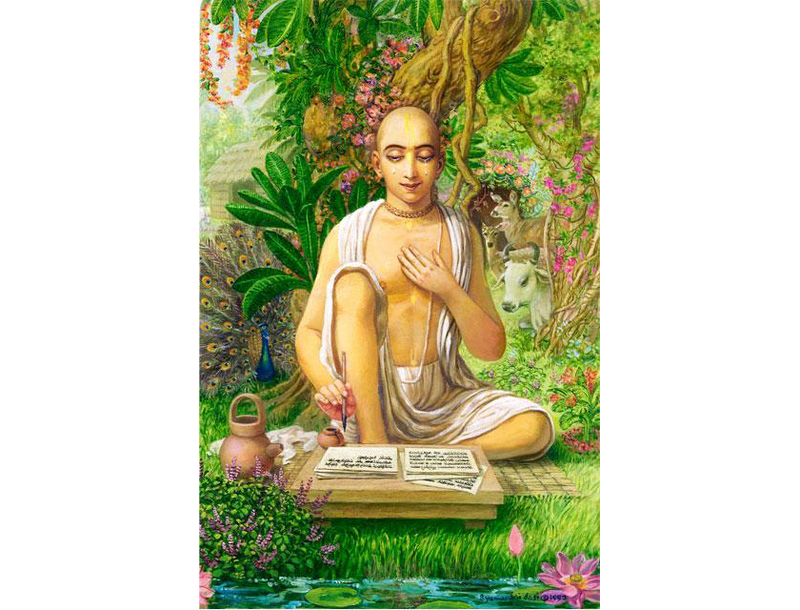 Visvanatha Cakravarti Thakura wrote over forty Sanskrit books on the science of pure devotion to Radha-Giridhari. He also made the sweetest, most highly realized rasika tikas (commentaries) on Srimad Bhagavatam, Bhagavad-gita, the works of Srila Rupa Goswami, Kavi Karnapura, and Narottama Dasa Thakura. Sri Krishna Bhavanamrta, Madhurya kadambini, Vraja-riti cin-tamani, Camatkara Candrika, Svapna Vilasamrta, Sankalpa Kalpa Druma, and others. The life and teachings of Srila Visvanatha Cakravartipada give happiness, inspiration, and transcendental wisdom to the entire Gaudiya Vaisnava sampradaya. We sincerely pray that after thousands of births we will someday qualify to become a particle of dust under the shade of his lotus feet. Srila Visvanatha Cakravartipada ki jai! In Krishna lila he serves Srimati Radhika as Vinoda-manjari. 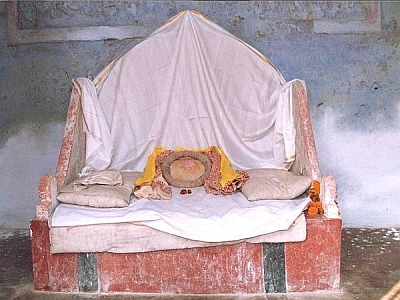 His samadhi is in the Radha Gokulananda temple courtyard.